The Vancouver Canucks are a professional ice hockey based in Vancouver, British Columbia. They’re part of the Pacific Division of the Western Conference of the National Hockey League (NHL). Their home arena is the Rogers Arena and the Canucks’ head coach is Travis Green. 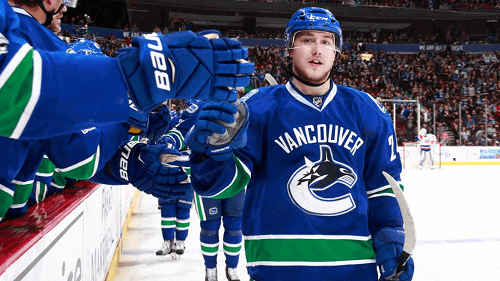 Read on for more on the Vancouver Canucks. The Canucks were originally founded in 1945 and were part of the Pacific Coast Hockey League. They then transferred to the Western Hockey League (WHL) in 1952. In 1970, they moved from the WHL to the NHL. Their colors are blue, green and white while their mascot, Fin the Whale, is a smiling orca in a blue Canucks jersey. Their rivals in the Western Conference are the Edmonton Oilers and the Calgary Flames. Although the Canucks have been dominating their Western Conference over the past decade, they have yet to win the Stanley Cup. They’ve emerged as the winners of their division seven times in nine seasons. Additionally, they scored the most goals in the NHL while giving up the fewest in their 2010-11 season. In the NHL, the Vancouver Canucks have won the Clarence S. Campbell Bowl in 1981, 1993, and 2010 seasons. Also, they took home the President’s Trophy in 2010 and 2011. Their individual players have won awards that include the Calder Memorial Trophy, Jack Adams Award, Budweiser NHL Man of the Year Award, and Scotiabank Fan Fav Award among others. The Vancouver Canucks have continuously missed the playoffs in recent years, and will do so until they rebuild their blueline and goaltending. They need to nurture and develop their new talent if they want to rise up to their previous levels. If they continue to do so, they may just stand a chance of lifting the Stanley Cup. However, right now, they aren’t bettors’ favorites.